Series introduced, let’s get on to documenting cephalopods. The collections I look after which are estimated to be up to a million specimens (likely not quite this high) come from most of the animal groups and a range of preservations (taxidermy, skins, skeletons, slides, models, casts, nests, eggs, shells, colonies, fluid preserved specimens) but I’ve chosen the cephalopods for this series as there’s a manageable amount of them, their organisation and taxonomy is relatively straight forward and theyjusthappentobemyfavouritegroupofanimals. Cephalopods are amazing group of molluscs (the group that contains snails, bivalves and others) that includes octopuses, the shelled nautilus, squids, vampire squid, cuttlefish and extinct animals like ammonites and belemnites. I don’t manage the fossil collections at the OUMNH so we’ll only be looking at recent groups in this series. This series doesn’t represent the only group I’m working on at any given time but a vertical slice through one group can be illustrative and useful. As part of this exercise, I’m looking to evaluate the data quality wrapped up in our specimens, the challenges facing museums trying to mobilise their data and the hidden history of the collection and from initial invesitgations there are some stories and significant specimens of interest worthy of further investigations. Cephalopods are also a largely overlooked group and niche within museums. There’s perhaps one dedicated cephalopod curator in the UK and the more numerous shell collections tend to attract more attention. In my initial time at the museum, I’ve been working on establishing a baseline for the information we know about the collections at the OUMNH. Until my post lines of responsibility for different parts of the collections varied highly so some parts are very well documented and others less so depending upon whether there was staff expertise or research remit. Hopefully it is obvious as to why museums need to document their material, they need to know what they have to make it accessible and usable both within the museum in research, exhibitions, display and public engagement and to the wider audience of international researchers be they scientists, artists or both. Estimating the backlog had never comprehensively undertaken with the zoological collections on the basis that the collections were so huge that time was needed to get to grips with the extent of the collections. Estimating the backlog and projecting future documentation work is one of the things that museums need to report on for Arts Council England Accreditation. Establishing how much of a backlog we have at the OUMNH and then planning how to tackle it is one of the priorities for my area of work so this exercise will be that process on a smaller scale. At the OUMNH, we have specimen, archive and digital collections as well as documentation that relates to these collections. Take a Nautilus shell for example, in a very much best case scenario, we’re not just interested in the object but all the information associated with it. The who, how, what, where and why. This both maximises the potential use of the specimen as well as contribute to the history of the collection, museum and ultimately the broader museums community. In natural history this associated information can take the form of photos, dissections, permits, permissions, 3D prints, slides, notebooks, CT scans, donor information, scientific articles, preparatory information, illustrations, documentaries, films, old labels etc. Obviously, it isn’t practical to keep all this information with specimens and in order to best manage the collections we use systems which hold all of this information for use so if a researcher asks if we have any Australian Nautilus specimens, I don’t have to physically check every individual specimen then report back, I can look up the information on a database or collections management system (CMS). That’s the ideal anyway but for many natural history collections, the vast sizes has meant that information hasn’t been synthesised into a system and for museums like the OUMNH we have information relating to our collections going back to the 17th Century in a variety of formats. So in museums when we refer to ‘documentation’ or ‘documented specimens’ it means that they have a proxy record with some (rarely all) of their information. In the 18th and 19th Century this took the form of lists, later on came card indices and nowadays we mean electronic systems. However, and this has been consistent across my museum career, rarely has the whole collection ever been documented. So some may have numbers that relate to older catalogues, some will have cryptic labels that refer to a now lost or defunct system, some will have their information written on them and some will have been published in papers or books. 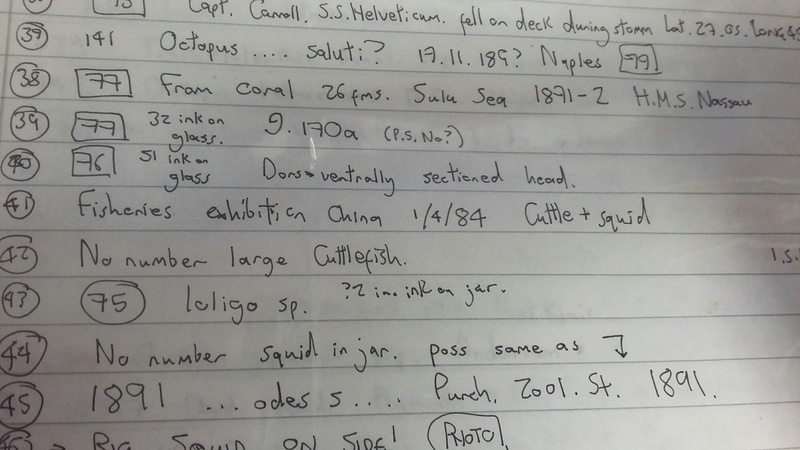 So this is my starting point, from familiarising myself with the collection I know where the majority of the physical cephalopod material is, the next step is to start documenting it. It started with a list and this shows the initial mess in interpreting labels. More on this next time. Well as I mentioned above, it started with a list. A handwritten list. A mistake of the past was to start with the documentation to hand- registers, lists and card indices, however, there has been a perpetually shocking turnover of material in natural history museums as material is lost, destroyed, transferred or thrown away. I prefer to start with the physical material as that’s a known entity before then tying all the associated information to them. Why a hand written list you ask, aren’t museums digital or even post-digital today? Well I’m afraid that 19th Century store design and the fact that most museums are maximised for efficiency of space means that many of the stores I manage don’t readily facilitate access to a power supply, wi-fi or even bench space so rather than cart specimens to and fro to the nearest work station a hand written list still beats digital solutions. I created a basic list recording all the available label information, a quick note about the specimen and the storage location, more details on this to follow. Then comes the spreadsheet. Why a spreadsheet you ask, aren’t museums systems a bit beyond that? Well at the moment the OUMNH are right in the middle of migrating all of our existing data into a museum collections management system, KE-Emu, so firstly this isn’t quite up and running and secondly information from a well designed spreadsheet can later be migrated into a CMS. The other downside to a CMS is that they are designed to hold every piece of information you’re likely to record about a museum specimen (which borders on infinite depending on how far you want to go). For most historic natural history specimens, there’s rarely basic let alone comprehensive information so it can be quicker to record this in a spreadsheet at the fact finding stage which really functions as a working document to build on back at the desk. Example of a section of the working spreadsheet. It doesn’t get much more exciting than this. Creating a spreadsheet or database uses fields as a key unit of information. Fields re discrete pieces of information that we (try) to record in a consistent way. All the fields relating to one particular specimen make up its record and we use fields to index information. Which is a fancy way of saying we consistently record information is a particular format as we all do when we use postal addresses for example. So person, street, county, postcode, country are the typical fields for a postal address and the whole address functions as a record. By being consistent about how we record information allows us to access it that much quicker. The post office would grind to a halt if addresses were free form- Mister James’ house which is blue, round the corner from the Queen’s Head next to Mrs Groggins house etc. In the 19th Century this was almost how some information was stored in long rambling descriptors. Today we arrange this information in fields and the kinds of information stored in them is guided in the UK by the SPECTRUM standard which advises how information should be stored for retrieval by museums. By indexing our collections information in this way, I save a whole lot of time answering typical questions like; do you have any Nautilus from Australia? Do you have any specimens collected by Charles Darwin? Do you have any female hog deer forelimbs? etc. Object number This is perhaps the key field we use in museums and it is also known as an accession or registration number. We give specimens a unique (in theory to museums across the world, if not in the UK) identifying number which we then hang all the other information off of. These numbers are normally generated from an accession register which is the master document of the museum’s contents with information about who, when and where specimens came from. We use a numbering system because it’s impractical to keep all the relevant books, photos, papers, notes with a specimen and for collections like natural history, we need some way to differentiate between the argonaut egg case collected by Charles Darwin, the one that was filmed in a documentary and the 48 near identical looking specimens. Unfortunately, numbering systems change over time and there is still an estimated 40% of the zoological collections which still haven’t been given one. This creates problems as we’ll see later. Other numbers As I mentioned above, specimens may bear a lot of different numbers- old accession numbers, collectors numbers, teaching numbers, auction lot numbers etc. At this stage I just record all the numbers I can find which aren’t obviously the main object number. This is normally quite easy but sometimes you have to go back to the original accession register to work out which number is which. We’ll return to these other numbers in the next part but for now I’m just recording them. Genus and Species One of the great aspects of managing a natural history collection is that the scientific names (Homo sapiens, Octopus vulgaris, Box boops) have been governed by an almost internationally agreed standard since the 18th Century. Today this naming system for animals is governed by the International Commission on Zoological Nomenclature (ICZN) so unlike paintings, sculpture, headdresses or cooking utensils we kinda have an internationally agreed off the shelf system to refer to different kinds of animals be they collected in Russia, the deep ocean, Essex or Oxford. In theory. The downside is that these names change all the time as our understanding of nature does. What may have been thought to be one species in 1780 may now have been split into a dozen today. For museums there’s an extra layer of complexity in that we may be dealing with material labelled in 1780 so have to redetermine, wherever possible, if the name is still valid and if it is the correct name for the animal we’re looking at. This can be easy for well-known whole organisms. This can be impossible with obscure or rare partial specimens as we will see later. Higher taxonomy The higher taxonomy is the tree of terms we use to differentiate between broader and broader groups of animals above the species level. This is one of the key fields for indexing collections and is essential to record to filter out or sort vast swathes of the collection. Nobody can remember every scientific name so the higher taxonomy helps divide life up and many specimens we can’t identify at the species level so we record them as far as we can identify them. For cephalopods, at the very top they are animals (kingdom Animalia), they share characters with snails, clams and chitons (phylum Mollusca), they’re united in being a big head with some arms (class Cephalopoda) and beyond that they are divided into the eight armed octopuses (order Octopoda), the shelled nautiluses (subclass Nautiloidea), the ten armed squids (order Teuthida), cuttlefish (order Sepiida) and others. Between these levels and the genus, species level is normally the family division which groups genera. By filtering my records on these fields I can quickly narrow down database searches e.g. I want to see all birds, I don’t want to see monotremes, I only want starfish etc. Again, the problem with this system is that this higher taxonomy changes all the time, even the one given above is contested, and although we use it as a way to file and filter museum collections, other scientists are trying to classify life. Palaeontologists have a similar but slightly different system and then geneticists and taxonomists use other systems. For example, the ‘squids’ which confusingly doesn’t include the bobtail, ram’s horn or vampire squids have can be grouped into orders Myopsida and Oegopsida as genetic work shows they aren’t as closely related as previously thought but have also been grouped more closely as suborders Myopsina and Oegopsina. It’s boring and complicated, suffice to say that most museums opt for a happy fudged system that helps them to find the material they need even if not all scientists subscribe to that specific classification. This information is normally added to records remotely whilst cross referencing against taxonomic databases. For cephalopods as near exclusively marine animals the most accessible one (with issues) is the World Register of Marine Species. Label name At the spreadsheet stage, I use this field to record a name on a label which isn’t the current valid name, usually after cross referencing with a taxonomic reference. It’s important to record all older names used for specimens as older publications may refer to specimens using these old names. Type status The idea of ‘types’ is a unique concept to biological specimens and type specimens are often those which were first used in formal descriptions of new species. Although all museum specimens are of equal value to a collections manager, type specimens have an important role in taxonomy. I won’t explain the whole system here, wikipedia has a good summary. We do have some cephalopod types in the collection, some of the first of a particular species to be described however, working out which specimen is a type or not can be very difficult for 19th Century and older species as the designation of types was far less formal than it is today and again a lot of those species have been changed over time and in some cases (possibly here) the type specimens have presumed to have been destroyed or lost so have been wrongly superseded by new types. More on this later. Object Category For all the blessings of having scientific names standardised, one area of information that isn’t standard across museum-sector wide systems is the idea of object category. In natural history this is another key field which is used to quickly filter out kinds of specimens we’re not interested in for searches. At the OUMNH we have a thesaurus which controls the terms that we use to divide the collections up.So for example some of those terms are fluid, taxidermy, egg, skeleton and the rather more problematic ‘dry’. We use this quick reference field because in a lot of cases users of collections will only want to see one kind of object based on its preservation so I can filter out everything but skeleton for osteology requests etc. The one category that isn’t perfect in the ways I’ve used it in the past is dry which is a grab bag term that describes anything that isn’t another category. So in our cephalopod example, beaks, cuttlebone, nautilus shell, argonaut egg case and squid pens would all be ‘dry’. Breaking dry into smaller sub categories begins to get arduous and the wonderful homology across nature gets in the way. For example, having ‘beak’ as a category is confusing as cephalopods, birds, dinosaurs, turtles and some fish which have ‘beaks’. For the most part, our cephalopods are fluid or dry so it’s quite easy! Description This is a brief object description, not a full on anatomical and preservation description which can take days for complex specimens. This short description should provide enough information for use in searching and indexing. Are we talking about one individual, a dissection, a shell, a bissected shell etc. Used to help differentiate between tens of specimens with the same taxonomy and preservation as well as in answering collection queries. Location An ‘exciting’ development at the OUMNH is the recent development of a museum wide location system so we can record exactly which shelf, drawer or case every specimen is. Previous to this, collections were organised in a systematic way- closely related things are organised together, which is fine as long as the system is perfectly maintained and adhered to but of course, collections often get in the way of order. Systematic systems were perfectly organised except for the large stuff, the specimens collected by a specific researcher, the stuff on display, the stuff that hadn’t been sorted yet, the stuff that Greg was looking at for 25 years etc. Another disadvantage of systematic arrangements is what do you do when a group is split up? How does a non-expert access the collection if they don’t know their loliginids from their ommastrephids? How’s that system going to look in 10, 20, 50, 100 years time? The massive advantage of systematic arrangement is you don’t need to record the specific location of a million specimens, which is years of documentation legwork. A quick audit of the locations for the cephalopod collection before documentation began and specimens were located in no less than 8 different rooms so I’ll be using our freshly pressed locations system for the first time for these collections. Collector Quite simply, who collected the thing. At this stage this is another grab bag of associated names as it often isn’t clear from one line labels if a person listed on a label was the donor, preparator, collector or identifier. In the absence of better data, a name associated with a specimen can be used to secondarily infer date ranges, assuming of course you’ve got the right Joe Bloggs or that the specimen hasn’t been mislabelled. Which happens. Collection Locality & Collection Date As above where and where the specimen was collected from. Similar issues here in that an isolated date can be collected date, documented date, donation date or processed date. Locality presents its own problems too if the name is not specific. For example one octopod specimen is labelled as ‘Cape’. Cape Town? Some other Cape that was shorthand for whoever wrote the label? Sometimes other information helps clarify unhelpful locality information. Sometimes. A lot of upcoming issues I can see is that many of our cephalopods were acquired from aquaria or the Marine Biological Association and this is given as their collection locality but obviously they came from elsewhere primarily. Notes The legendary feared field that quickly degenerates into a dumping ground if not kept in check. At this stage, any extra information that doesn’t fit into one of the above fields will be recorded here but ultimately we aim to keep information out of this field as it’s not a useful one for indexing and if the information is important enough, it should be recorded elsewhere. At the level of the inventory it’s a useful field to record some things that need further cross referencing or for rare information that doesn’t need a separate field for a single entry cluttering up the spreadsheet. Citations One of the great mysteries of working with natural history collections is how important at the time scientific research sometimes doesn’t end up attached to the specimens that research was about. A previous blog post here on my thoughts about that. Occasionally, publication information will be attached to a specimen, normally it’s in an abridged format like Nat.Sci.Zoo 44 or Peterson page 12. Which is great when Nat.Sci.Zoo is a well known journal in print or Peterson a core work on a topic. Less great when Nat.Sci.Zoo faded into obscurity in 1854 or when Peterson was just a previous curator’s bezzie mate. So there we have it. This was the bare bones inventory spreadsheet I was looking to fill and there will likely be a few more fields added as the inventory work begins. I don’t think museum documentation work is a field that requires deep theory but there is a mile between good and bad documentation systems so this is how I began mine informed by a decade or so of museum work. For the two people who got this far, let me know if you have any comments or suggestions or questions on the method. My plan is to grab small amounts of time here and there to progress the overall inventory of the cephalopod collection and report on the progress here. I’ve not fully sketched out how they will be presented but here’s roughly how the next few parts will look like.